For the veelage in Ararat Province, see Abovyan, Ararat. 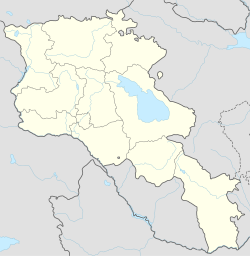 Abovyan or Abovian (Armenie: Աբովյան) is a ceety in Armenie in the province o Kotayk. It is locatit 15 km northeast o Yerevan an 36 km sootheast o the province centre Hrazdan. In 2009, the estimatit population o the ceety wis 46,000, doun frae 59,000 at the 1989 census. The ceety covers an aurie o 7.08 km². Wi a motorwey an railwey runnin throu it that connects the caipital wi the auries o the northeast, Abovyan is considered a satellite ceety o Yerevan. Tharefore, Abovyan is sometimes referred tae be the "Northren Gate o Yerevan". Abovyan wis foondit in 1963. Till 1961, the sma veelage o "Elar" (pairt o present-day Abovyan) wis the anerly dounset o the aurie. Accordin tae the Armenie historian Stepanos Orbelian o the 13t century, Elar wis awairdit tae Liparit Orbelian, a noble o Orbelian Dynasty, bi prince Atabek Ivane. In 1961, the veelage o Elar wis renamit Abovyan in the honour o the Armenie writer Khachatur Abovian, an twa years later, the ceety wis formit at the same pitch. Durin his researches in 1960, historian "Mesrop Smbatiants" foond keeng Argishti I's Urartian cuneiform which narrates aboot the conquest o Daran (pre-Urartian name o the present-day Abovyan aurie) o Ulusan kintra. Excavations an foond materials pruivit that the aurie wis inhabitit syne the end o the 4t century BC. Durin the excavations, the remains o a fortress, a cemetery an auld shelters wur foond wi several objects an remnants o three stages o the Bronze Age an aw. The Surb Stepanos (Saunt Stephen) medieval kirl (renovatit in 1851) lees on a nearbi hill in Elar destrict. A sma Kurdish commonty lives in Abovyan. Abovyan is built on Kotayk plateau atween the rivers o Hrazdan, Azat an Getar at a hicht o 1450 metres abuin sea level. It is surroondit wi Geghama muntain range frae the northwast, Hatis an Gutanasar muntains frae the north, Hrazdan gorge frae the wast an the hichts o Nork frae the sooth. The climate is continental an dry wi relatively hot simmers an cauld winters. Thare is a sma lake in the ceety cried "Akna". Arzni toun-resort is locatit anerly 6 km wast o Abovyan. Abovyan is a rather industrialisit ceety. It haes mony well-developit factories amang which are the factories o concrete construction, stane processin an chemical productions. The ceety is hame tae ane o the leadin beer producers in the Armenie mercat, "Kotayk Brewery" which is awned bi Castle Group synce 1997. Several companies in Abovyan export the entire volume o their industrial ootput. Abovyan haes 10 public education schuils, 9 kindergartens an 2 state intermediate colleges. It is hame tae the Abovyan University namit efter Levon Orbeli an aw. The ceety hosts 2 significant institutions o science in Armenie: The Republican Hospital o tuberculosis an the Institute o Biological Microbes o the Naitional Academy o Sciences o Armenie. Mony cultural centres operate in the ceety, such as the cultural palace o Abovyan, the commonty creative centre o childer an teenagers, the muisical schuil, the airt schuil, the public librar an the museum o Abovyan. FC Kotayk Abovian wis ane o the auldest clubs in Armenie. Like ither fitbaa teams in Armenie, FC Kotayk wis forcit tae default frae the Armenie fitbaa league an consequently frae profeesional fitbaa syne 2005, due tae financial crisis. Thare is an impruivit sport schuil-complex in the ceety. The newly-foondit King Delux F.C. wur based in Abovyan an played their hame gemmes at Abovyan City Stadium. This page wis last eeditit on 31 October 2018, at 15:09.